In his college days, Stepehen took up skydiving and competed on the UC Davis team. While working for the U.S. Fish and Wildlife Service, we sold our former home in Boston and were fortunate to buy a house outside of St. Helena that just happened to come with an already-planted vineyard. While visiting family in San Francisco, we came up to the Napa Valley on one of our trips. We really enjoyed a bottle of Villa Mount Eden 1974 Cabernet Sauvignon and promptly bought our very first case of stellar Cabernet and shipped it back East. 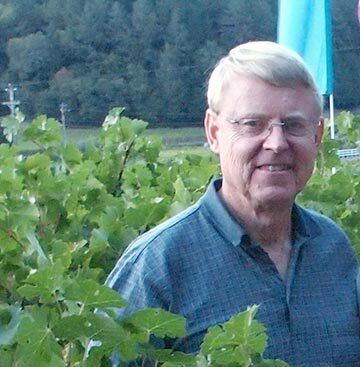 Both being very small vintners, we reached out to Rick Jones of Jones Family Vineyards for advice on how best to market our Cabernet. The people we meet who purchase our wine and then become friends rather than just customers. Shipping our wine to members who live all over the U.S. and working with distributors. We farm our vineyard using sustainable practices, including a no-till cover crop under the Napa Green program. We also participate and donate our wine to a number of health-related charities in the Napa Valley and around the country. Even a winery as small as we are – 200 cases a year – can be successful in the Napa Valley. I would be retired for the second time and doing more traveling and wine tasting in the Napa Valley and other wine regions! My father, Teddy Roosevelt and Aldo Leupold . Aldo is considered the father of wildlife management and environmental ethics. Be prepared to work hard both in growing grapes - after all, it’s farming - and marketing your wine. A great wine rating is not the silver bullet! In my carefree college days, I took up skydiving and competed for the UC Davis skydiving team. Even a winery as small as we are can be successful in the Napa Valley.